Matching the language of the user is a core component of Windows Runtime APIs. The ability to determine a best match between available resources and the user's preferred languages is necessary to provide the best user experience when working with multilingual apps. This topic describes the logic used to determine the best match. Windows enables users to accurately describe their language preferences. It also gives developers flexibility in describing the language of their content to enable efficient localization and deployment as well as good user experience. The developer is not required to write any special code for this, or to have a deep understanding of languages and language matching logic. Windows ensures that users consistently get the best language experience with limited work on the part of the developer. Windows includes a specific mechanism for comparing and scoring a prioritized list of language matches. The scoring mechanism uses data that is included in the BCP-47 subtag registry, and other data sources. It allows for a scoring gradient with different qualities of match and, when multiple candidates are available, selects the candidate with the best matching score. This enables developers to tag language content in generic terms, but still specify specific content when needed. For example, an English app may have many strings that are common to both the United States and British versions. Tagging these strings as simply "en" (English) saves space and localization overhead. When distinctions need to be made, such as in a string containing the word "color" or "colour", the United States and British versions can be tagged separately, as "en-US" and "en-GB" respectively. Script subtag (which may be inferred using the default specified in the subtag registry). Additional subtag elements may be present, but will have a negligible effect on language matching. There are no language ranges defined using the wild card ("*"), for example, "en-*". Whenever Windows compares two languages it is typically done within the context of a larger process. It may be in the context of assessing multiple languages, such as when Windows generates the application language list (see How to manage language and region). Windows does this by matching multiple languages from the user preferences to the languages specified in the app's manifest. The comparison might also be in the context of assessing language along with other qualifiers for a particular item. One example is when Windows resolves a particular file resource to a particular resource context, with the user's home location or the device's current scale or dpi as other factors besides language that are factored into the resource selection. When two language tags are matched, the comparison is assigned a score based on the nearness of the match. Two tags are exactly equal regardless of the number of subtag elements they contain. A comparison may be promoted to this match type from a variant or region match. Two tags match on the language, script, region, and variant subtags, but differ in some other respect. Two tags match on the language, script, and region subtags, but differ in some other respect. Both tags match on language and script subtags; both tags have region subtags, one of which denotes a macro region that encompasses the other region. The macro region subtags are always numeric and are derived from the United Nations Statistics Division M.49 country and area codes. For details on encompassing relationships, see Composition of macro geographic (continental) regions, geographical sub-regions, and selected economic and other groupings. Note UN codes for "economic groupings" or "other groupings" are not supported in BCP-47. Note A tag with the macro-region subtag "001" is considered equivalent to a region-neutral tag. For example, "es-001" and "es" are treated as synonymous. Both tags match on language and script subtags, and just one tag has a region tag. A parent match is preferred over other partial matches. Both tags match on language and script subtags, and the region subtags have orthographic affinity. Affinity relies on data maintained in Windows that defines language-specific affined regions, for example, "en-IE" and "en-GB". Both tags match on language and script subtags, and one of the region subtags is the default region subtag for the language. For example, "fr-FR" is the default region for the "fr" subtag. This relies on data maintained in Windows defining a default region for each language in which Windows is localized. Both tags match on language and script subtags, and both have region subtags, but no other relationship is defined between them. In the event of multiple sibling matches, the last enumerated sibling will be the winner, in the absence of a higher match. A resource may be tagged as "und" to indicate that it matches any language. This tag may also be used with a script tag to filter matches based on script. For example, "und-Latn" will match any language tag that uses Latin script. See below for more details. When the two tags match only on the primary language tag but not the script, the pair is considered not to match and is scored below the level of a valid match. Mismatching primary language subtags are scored below the level of a valid match. A user language "zh-Hans-CN" (Chinese Simplified (China)) would match the following resources (if provided by the app) in the priority order shown. An X indicates no match. 1. Exact match; 2. & 3. Region match; 4. Parent match; 5. Sibling match. 1. Exact match; 2. Macro region match; 3. Region-neutral match; 4. Orthographic affinity match; 5. Preferred region match; 6. Sibling match. At times, matching occurs as part of a bigger process of matching a single language to a list of languages. For example, there may be a match of a single language-based resource to an app's language list. The score of the match is weighted by the position of the first matching language in the list. The lower the language is in the list, the lower the score will be. Language list (in order): "pt-PT" (Portuguese (Portugal)), "en-US" (English (United States)), "pt-BR" (Portuguese (Brazil)). Resource with the higher score: "en-US". Description: The comparison starts with "pt-PT" but does not find an exact match. Due to the presence of "pt-BR" in the user's language list, partial matching is postponed to the comparison with "pt-BR". The next language comparison is "en-US", which has an exact match. So the winning resource is "en-US". Language list (in order): "es-MX" (Spanish (Mexico)), "es-HO" (Spanish (Honduras)). Resource with the higher score: "es-HO". Resource with the higher score: "und". Description: The comparison starts with "en-US" but does not find a match based on "en" (partial or better). Since there is a resource tagged with "und", the matching algorithm uses that. 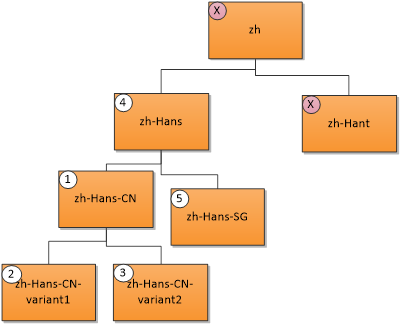 Resource with the higher score: "zh-Hans-CN". Description: The comparison finds an exact match for the first item and so doesn't check for the resource labeled "und". Resource with the higher score: "und-Cyrl". Description: The comparison doesn't find a match for "ru" (partial or better), and so matches the language tag "und". The suppress-script value "Cyrl" associated with the language tag "ru" matches the resource "und-Cyrl". When two language tags with region subtag differences are matched, particular pairs of regions may have higher affinity to one another than to others. The only supported affined groups are for English ("en"). The region subtags "PH" (Philippines) and "LR" (Liberia) have orthographic affinity with the "US" region subtag. All other region subtags are affined with the "GB" (United Kingdom) region subtag. Therefore, when both "en-US" and "en-GB" resources are available, a language list of "en-HK" (English (Hong Kong SAR)) will get a higher score with "en-GB" resources than with "en-US" resources. Certain languages have large speaker communities in different regions that use different varieties of that language—languages such as English, French and Spanish, which are among those most often supported in multilingual apps. Regional differences can include differences in orthography (for instance, "color" versus "colour"), or dialect differences such as vocabulary (for instance, "truck" versus "lorry"). These languages with significant regional variants present certain challenges when making a world-ready app: "How many different regional variants should be supported?" "Which ones?" "What's the most cost-effective way to manage these regional variant assets for my app?" It is beyond the scope of this topic to answer all these questions. However, the language matching mechanisms in Windows do provide capabilities that can help apps in handling regional variants. Apps will often support only a single variety of any given language. Suppose an app has resources for just one variety of English that are expected to be used by English speakers regardless of what region they are from. In this case, the tag "en" without any region subtag would reflect that expectation. But apps might have historically used a tag such as "en-US" that includes a region subtag. In this case, that will also work: the app uses only one variety of English, and Windows handles matching a resource tagged for one regional variant with a user language preference for a different regional variant in an appropriate way. If two or more regional varieties are going to be supported, however, a difference such as "en" versus "en-US" can have a significant impact on the user experience, and it becomes important to consider what region subtags to use. Consider an example: Suppose you want to provide separate French localizations for French as used in Canada versus European French. For Canadian French, "fr-CA" can be used. For speakers from Europe, the localization will use French (France), and so "fr-FR" can be used for that. But what if a given user is from Belgium, with a language preference of "fr-BE"; which will they get? The region "BE" is different from both "FR" and "CA", suggesting an "any region" match for both. However, France happens to be the preferred region for French, and so the "fr-FR" will be considered the best match in this case. Suppose you had first localized your app for only one variety of French, using French (France) strings but qualifying them generically as "fr", and then you want to add support for Canadian French. Probably only certain resources need to be re-translated for Canadian French. You can continue to use all the original assets keeping them qualified as "fr", and just add the small set of new assets using "fr-CA". If the user language preference is "fr-CA", then the "fr-CA" asset will have a higher matching score than the "fr" asset. But if the user language preference is for any other variety of French, then the region-neutral asset "fr" will be a better match than the "fr-CA" asset. As another example, suppose you want to provide separate Spanish localizations for speakers from Spain versus speakers from Latin America. Suppose further that the translations for Latin America were provided from a vendor in Mexico. Should you use "es-ES" (Spain) and "es-MX" (Mexico) for two sets of resources? If you did, that could create problems for speakers from other Latin American regions such as Argentina or Colombia, since they would get the "es-ES" resources. In this case, there is a better alternative: you can use a macro region subtag, "es-419" to reflect that you intend the assets to be used for speakers from any part of Latin America or the Caribbean. Region-neutral language tags and macro region subtags can be very effective if you want to support several regional varieties. To minimize the number of separate assets you need, you can qualify a given asset in a way that reflects the broadest coverage for which it is applicable. Then supplement a broadly-applicable asset with a more specific variant as needed. An asset with a region-neutral language qualifier will be used for users of any regional variety unless there is another asset with a more regionally-specific qualifier that applies to that user. For example, an "en" asset will match for an Australian English user, but an asset with "en-053" (English as used in Australia or New Zealand) will be a better match for that user, while an asset with "en-AU" will be the best possible match. English deserves special consideration. If an app adds localization for two English varieties, those will likely be for US English and for UK, or "international", English. As noted above, certain regions outside the US follow United States spelling conventions, and Windows language matching takes that into consideration. In this scenario, it is not recommended to use the region-neutral tag "en" for one of the variants; instead, use "en-GB" and "en-US". (If a given resource doesn’t require separate variants, however, "en" can be used.) If either "en-GB" or "en-US" is replaced by "en", then that will interfere with the orthographic regional affinity provided by Windows. If a third English localization is added, then use a specific or macro region subtag for the additional variants as needed (for example, "en-CA", "en-AU" or "en-053"), but continue to use "en-GB" and "en-US".